My entire world is topsy turvy now. Slept for the entire afternoon, woke up for a meal, the best friend popped by (and commented how pronounced my eye rings were), watched some tv, went back to bed, and now awake at 4am- bright-eyed and bushy-tailed. It feels a bit surreal to be home. Not that I was overseas for long but because the internships added up to quite a fair bit of time away from the house. Flying to and fro was a chore. I flew on economy (SIA) and we had to transit at Frankfurt. Gosh it was BAD thanks to turbulence and delays due to some computer malfunction in the plane. The good thing was I made a new friend that day. The parents were both flying business so I sat with a Malaysian living in Rochester, New York. He had it worse. KL -> Spore -> Frankfurt -> NY -> Rochester. Though a seasoned traveler by now, he was still dead beat from everything. Thank goodness food was okay. We had a good time gobbling up the beef curry hahaha. Coming back dad used his miles to upgrade my seat 😀 Food wasn’t as good this time around (maybe I just ordered the wrong stuff). While the French Toast with caramelised bananas were all right, their rice with cod was quite bad. The MSG in the oyster sauce was so unbearable I had to waste all that food. But the ultimate comfort food were their belgium waffles. 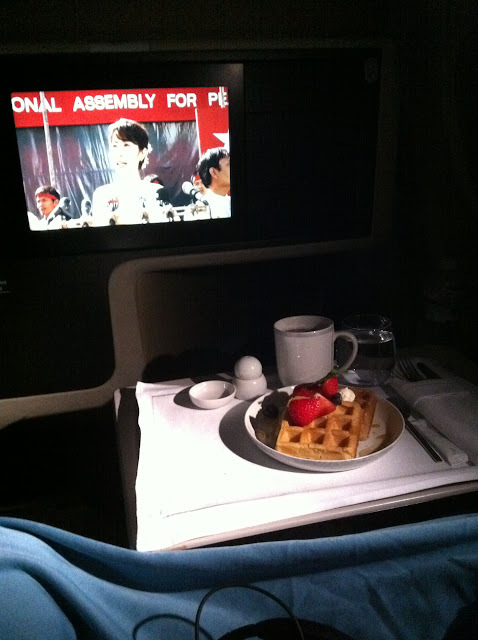 No idea how they retained that crispy exterior and soft, airy insides but these were one of best waffles I ever had (or maybe it just tasted better up in the air…). Consistency was lacking though cuz dad got soggy waffles. Still.. fascinating technology they have there! On a separate note, please watch The Lady. Michelle Yeoh’s performance was flawless. That poise and restrained emotion is exactly how I see Aung San Suu Kyi. The flow of the movie was great too. So many climaxes, the political tensions at the background (I suppose some may not agree with their interpretation but I personally found it neutral) and more importantly, the unseen role played by her late husband in her life. Anyway I had a wonderful time in both Massachusetts and New York. The former especially. I was pretty much left to my own devices in the day, while nights are spent with dad and his colleague. I’ll elaborate more about the other attractions in another post. Let’s just say if american history and art are things you find joy in, you won’t be bored around Massachusetts. Transportation is really straightforward (and cheap too, $18 USD for a Charliecard that gives you unlimited rides on the sub/bus for 7 days). The sub pretty much connects all the major attractions in Cambridge and Boston to you. I stayed in Cambridge, near MIT but shuttling to and fro was really simple. If you want to go Charlestown where the USS Constitution and Bunker Hill is, you can either follow the Freedom Trail (a red brick route that runs all the way from Boston Commons to Bunker Hill) or sit a bus which was what I did. I did my research every night before setting off on my ‘adventures’ the next day. Thank goodness for free WIFI! New York was a wholly different experience mainly because I was travelling with mum. I had grand plans of visiting the Guggenheim and the Met but mum looked very very content shopping so I let her have it (I admit it was quite enjoyable though haha). 5th avenue and SOHO are great places to buy stuff or just window shop. Huge flagship boutiques and great design concepts. Our holiday there coincided with their summer sale and restaurant week. Perfect timing! Since I have so much free time in my hands I’ll post more frequently for the next 2 weeks. After that, it’ll be time for Paris and exchange in Dublin!